With an annual snowfall of 8.75 m (29 feet) and limitless terrain, Fernie has a ski experience to meet the needs of all abilities. When will it snow in Fernie? 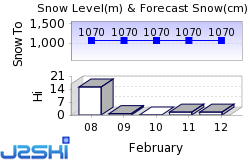 The next notable snow forecast for Fernie is 4cm1in, expected on 26 April, with around 24cm10in forecast over the next 7 days. The Canadian Ski Resort of Fernie is one of the larger Ski Resorts in Canada and has direct access to 220km137 miles of downhill skiing, with 107 marked pistes, served by a total of 10 ski lifts. The facilties at Fernie have grown dramatically over the last few years and the result is a destination resort that takes its place among North America''s finest. Located in the south-east corner of British Columbia, Fernie's skiable terrain doubled in 1998 with the addition of two new lifts. The powder that has made Fernie a haven for deep snow enthusiasts is produced by storm systems that develop over the Pacific Ocean off the coast of Northern Oregon. The predominant south-westerly flow chugs across the near desert-like terrain of central Washington and Idaho before slamming into the Lizard Range of the Canadian Rockies. Visitors to Fernie may wonder about the origins of the Griz Festival and why Griz is so important to the locals. According to legend, Griz is the Powder King and provider of the 8.75m/29 feet of snow which falls here annually. As the legend goes, a baby boy was born in a grizzly bear's cave high in the mountains. The boy managed to avoid being eaten by a grizzly and was somehow able to survive the harsh winters. He has been spotted recently and is now said to have 6ft wide shoulders and carry an 8ft long musket which he shoots at clouds, releasing his special brand of powder snow making Fernie the beneficiary of some of the best packed and powder conditions in Western Canada. In recognition and admiration of the man who became known as Griz, the town's people held a festival all week with sporting events, competitions, parades and gatherings to mark the gala week. The citizen who best embodied the spirit of Griz; through that week was made honorary Griz for the rest of the year. To this day this festival continues every March in tribute to Fernie''s Powder King. and are no longer accessible to anyone, underground tunnels once used for bootlegging still form a network beneath the city's streets. One of Fernie's legends is based around William Fernie''s discovery of the coal. During one of his many prospecting trips he met a tribe of Kootenai Indians and noticed one of the Chief''s daughters wearing a necklace of black stones which he immediately recognised as coal. On enquiring about the source of the black beads the Indian Chief agreed to show him, on condition that the prospector marry his daughter. After finding out where the coal had come from Fernie, who had already given his word he would marry the Princess, renaiged on the deal. Naturally, this deeply angered the Indian Chief who invoked a fire, flood and famine curse on the valley. Fire did destroy a large part of Fernie in 1904, the year it was incorporated as a city, and again in1908 when the Great Fire left only 37 buildings standing. Most of these buildings were residential and can still be seen along Park Avenue and at the end of 1st Avenue. the disaster helped Fernie become stronger than ever in the years afterwards. Only 4 months after the fire a business district of stone and brick was well on its way to completion and today those same buildings stand as testimony to their hard work and efforts. Floods hit Fernie in 1916 as the Elk River burst its banks waterlogging parts of the valley and town and near-famine arrived in the 1930's in the form of the Great Depression. In 1964 members of the Kootenai tribes, headed by Chief Red Eagle, assembled in Fernie for a special ceremonial lifting of the curse, during which the town''s Mayor, James White made amends by smoking the Pipe of Peace with Chief Red Eagle. These days the only remainder of the curse, known as the Ghostrider of Mount Hosmer, can be seen each sunny summer evening when the sun casts the spectacular shadow of an Indian chief on horseback with an Indian maidenstanding beside him. The town has an unspoilt nature; a sense that nestled here, under the Rocky Mountains, is a place that offers a retreat from the world and all its modern trappings. New residents come to get away from the complications of modern life that seem so inherent to the city. With only three traffic lights, Fernie lends itself to the process of slowing down and getting more in tune with the world. Although there is still coal mining, in recent years its been the ski resort that has attracted both investors and development to the area. With an influx of new interest, the town of Fernie has retained its historic nature and ambiance while also moving forward to meet the growing demand for service that can compete in a global market. Visitors to Historic Downtown Fernie have come to see the town as a destination for shopping, restaurants, bars, nightlife and entertainment. The most difficult run is the 'Corner Pocket'. Renowned for its superb natural snow conditions the season at Fernie usually starts at the end of November and lasts well into April with an annual average snowfall of 8.75m (29 feet) thanks to the legendary Griz and his trusty musket. To this day the residents of Fernie pay tribute to the Griz by holding the annual Griz Festival as homage to their Powder King. For the ultimate powder experience Fernie has its own First Tracks programme which involves an early start but is well worth it to make your own first tracks in the fresh powder. The lower mountain is a beginners delight and the runs are all well marked with return to base access so parents can relax while the kids are out enjoying themselves. There are 119 defined trails, five alpine bowls and acres of tree skiing/boarding to test your skills on. Experts are never bored gliding through the glades, dropping off ridges, checking out chutes or making first tracks in the powder. The Mini Moose and Mighty Moose lifts are the places for first-time skiers though for the ultimate confidence boost a lesson with the Winter Sports School is recommended to really get you cruising with style. Lessons are available in all disciplines from alpine to telemarking and cross-country. Guided tours of the cross country trails are also available with 14km of trackset and groomed trails through the pine forests below the Siberia Bowl and beyond. Every Friday to Sunday everyone has the chance to take part in a fun NASTAR race with family and friends for all ages and abilities. The race includes two timed runs and everyone who participates will receive an official NASTARrace pin. Fernie is highly rated by Snowboarders and there are a variety of Snow and Terrain Parks in Fernie. We don't currently have confirmed season dates for Fernie. NOTE:- Lift and Piste openings are always subject to Snow Conditions in Fernie. Fernie is able to make snow, with 2 snow cannons. The 10 ski lifts of Fernie are able to uplift 13,716 skiers and snowboarders every hour. Fernie is in the Canadian Rockies in East Kootenay, British Columbia, Canada. The nearest airports to Fernie are Canadian Rockies and Glacier Park, all within three hours drive. The Webcams in Fernie are not always up-to-date. Please check the date on the image to ensure you are seeing current snow conditions. Many of Fernie's after skiing activities take place on snow and include various different ways of taking in the spectacular mountain scenery with the choice of various modes of transport. Fernie Wilderness Adventures have a 1,000 acre playground of private land with an almost non-existent avalance risk. Experienced guides will take you to places you would probably never find by yourself and where you can expect to see deer, moose, elk, rocky mountain bighorn sheep and possibly even the occasional wolf, coyote. lynx or bobcat. You could learn to mush your own sled with an introduction to the basics of handling a team of dogs. If you prefer a more relaxing option there are horse-drawn sleigh rides varying from a half hour trip to an entire evening with inclusive Cowboy Dinner. A great way to pick up some skill building tips could be on a cross-country ski or snow shoe tour with an experienced guide who will very likely be a mine of information with lots of local knowledge. The Powderhorn Restaurant and Lounge has one of Fernie's largest outdoor patios and is the perfect place to unwind and relax by the fireside and enjoy a drink with friends after a day on the hill (children welcome too). If you decide to travel to Downtown Fernie The Grand Central is worth visiting. Its a historic hotel with a recently renovated bar and has the honour of being Fernie's first smoke free bar. Its a popular party spot with live music, funky guest DJs, large TV screens, pool tables and food. Another spot for live music, especially classic rock and blues, is The Northern, or theres The Eldorado Lounge, located in the old historic livery building the interior is very modern and live music and DJ's keep the crowds dancing. Other popular Ski Areas near Fernie. Want to ask about skiing and snowboarding in Fernie? Or contact Fernie Tourist Office. Note :- The information on J2Ski concerning Fernie, where not clearly factual, is opinion only and is neither definitive or exhaustive.